A Chinese proverb goes: "the Moon cannot be full for 100 days and flowers cannot be in full colors for over 100 days". But the national flower of Burma � the prince of orange � because of its long blossom period, is called "a flower in full color for over 100 days". 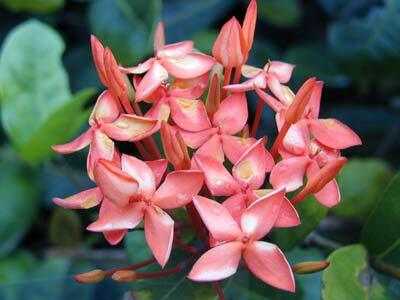 Prince of orange is an evergreen shrub, and its blossom period lasts from summer to autumn. The flower blossom out for quite a long time but its colors would never fade. Its small pedals look like the seeds of melons, which grow on the twigs in crowds; and their colors are extremely bright and red, like flames of a burning fire. Though the plant of the flower is short and small, its flowers and leaves are very beautiful; therefore, it is quite suitable for gardening in yards and viewing. People can also plant the flowers in bushes, under trees or beside roads. The Yisteha people of Burma have a quite romantic and interesting custom of marriage. They live along waters since ancient times. If a family has a young girl, they often build a floating garden with bamboos or woods on the water surface nearby home before their daughter�s marriage. The family would plant prince of orange in every place of the garden and tie the garden with chains or ropes to the banks. On the day when the young girl marries off, they would cut off the ropes and let the garden float downstream. The bridegroom would begin to wait for his bride from early morning in the downstream; when the small garden with his bride float near, the bridegroom would grasp the rope and push the boat garden ashore; then he would take his bride home to hold their marriage ceremony.